Plug n Play Perth is currently run on an irregular basis at the fabulous tiger, tiger coffee bar. If there are dates coming up we will post them on our Facebook page and on our Events Page. Plug n Play was Perth's first regular audio-visual jam night. 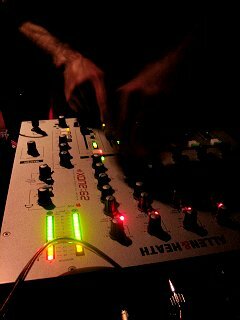 It ran from 2005-2007, inspired by the vibe of Melbourne's very cool Plug n Play at Fitzroy's Kent St Cafe. You can bring your own lappie to VJ, or just your showreel on DVD, portable Hard Drive, mini DV, thumbdrive or whatever you've got. If you use some weird codec, bring it along - and we're mostly PC so make sure your video files are PC compatible. And bring all your cables, adapters etc. Email us with any tech questions, eg if you want us to pre-test a clip to see if we have compatible codecs. 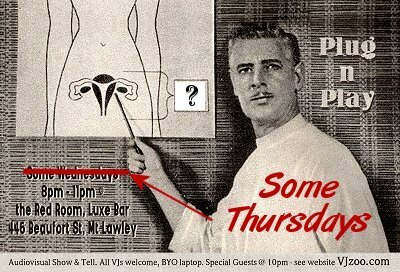 At 9pm, there may be Special Guests - an AV act, or a DJ or electronic musician doing a set accompanied by experienced VJ's. Check the Events page to see who's booked. 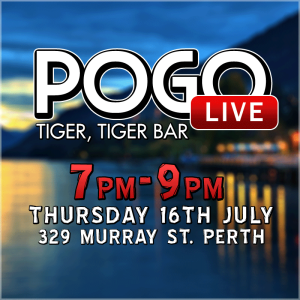 As well as hosts Jasper and Kat from VJzoo, various other Perth VJs are also involved, so it's a great opportunity to Masterclass even if you've already had some experience with VJing. Entry is free (we hope to keep it that way), and cocktails are $12. Space is limited, so we don't promote PnP very widely as a free gig for general punters - we really want an audience of people who are sincerely interested in visuals and AV. When we have popular Guest Acts, it can get a bit crowded so it's a good idea to arrive early. If you're a musician who'd be interested in performing at Plug n Play Perth, drop us a line. It's unpaid, cramped and the audience is pretty small, but you might enjoy seeing what the VJ's come up with, or perhaps you'd like to do an AV set of your own? Yay! The first Plug n Play Perth was held at Bluprint Nightclub on 3rd September 2005, but the venue just wasn't suitable. 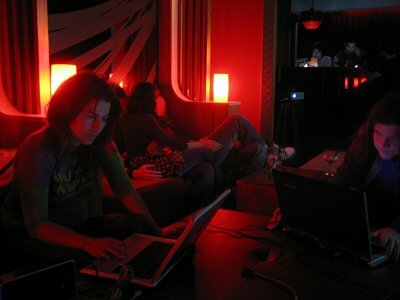 We ran Plug n Play at the very luxurious Luxe Bar from 2006-2007. It's at a licenced venue, over 18's only sorry. If you're under 18 and are interested in learning to VJ, drop us an email and perhaps we can organise something with PropelArts. Why do we run PnP? finding new musicians to collaborate with. encouraging appropriate payment of VJ's. Pay peanuts and you'll get monkeys. We're not saying we disapprove of VJs doing benefit and non-profit gigs for free, but for commercially viable events it's appropriate that VJs are paid a rate that reflects their skills, the value of their equipment and what they will add to the experience at the event. encouraging venues and promoters to give VJ's billing on posters, ads etc. Professional VJ's work just as hard as a support band/DJ and usually for a lot more hours, and increasingly punters will be looking for VJ's names it will become an additional draw for the event. Australia now has PnP in Melbourne, Perth (ours) and Sydney, and there are a few similar events in the US such as la-va in LA and Video Salon in SF. Similar events have also recently been started in London, such as AV Social, and Roxy Bar and Screen. Turbine37 did a kick-arse hard breaks set in Feb07. In fact, Melbourne has far more than it's fair share of cool venues. Some of our favourites are described here. We're really hoping that when Western Australia's new "Small Bar Licence" is introduced in 2007, we'll get more funky little venues like this here. If you're thinking of opening such a venue and you'd like some technical advice and/or curation, let us know.